Fans of the original 1987 Predator can now drink whiskey based on the iconic action sci-fi movie. Silver Screen Bottling Company and Fox Studios have collaborated to bring the new whiskey to fans, which is called Dutch Bourbon Whiskey. The name is obviously a reference to Arnold Schwarzenegger's Major Alan "Dutch" Schaefer character from the movie and the bottle features a helicopter in flight with the Predator's target it on it. Dutch's famous "Get to the Chopper" line is printed below the image. The Predator whiskey bottle even has a tiny image of the titular character's mask on its neck. The official site for the alcoholic beverage plays off of the imagery from the movie and references some dialogue when describing the bold flavor from inside the bottle. For Predator fans who want to know what this drink is all about, you can read the description below. "Soon, the hunt will begin. 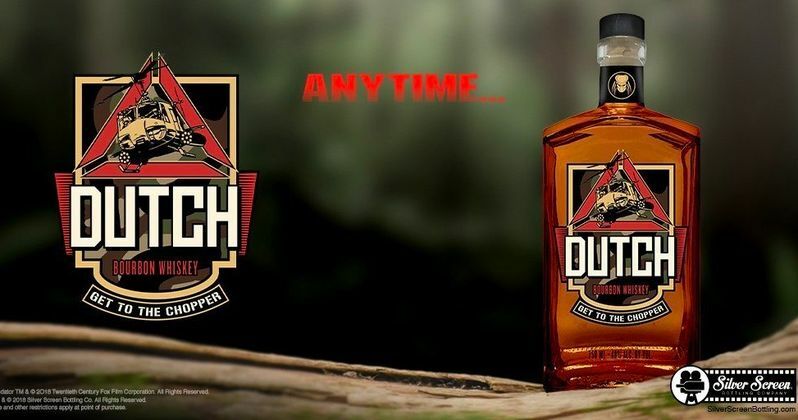 Introducing Dutch Whiskey, fit for a man on a mission with a bold taste for adventure who ain't got time to bleed. This whiskey will do more than cover you with mud, it will take you to a new level with its full-bodied flavor and hints of vanilla, coconut, and bergamont." The Predator whiskey is currently not available, but the official site is taking pre-orders for $34.99. The bottle is pretty cool, even if you don't drink what's inside it, but will fans be willing to spend that kind of money on a novelty whiskey? We'll just have to wait and see, but it looks promising at the moment. Silver Screen Bottling Company previously did a liquor for Star Trek and the Fallout video game series. The Predator whiskey bottle invites us to get to the chopper, but it's not a good idea to operate any heavy machinery after drinking any alcoholic beverage. So, stay away from helicopters (and cars) if you decide to pre-order the Dutch Whiskey. Instead, hit the couch with a glass and turn on Predator to enjoy one of the greatest movies of all time. Then, if you're feeling pretty good, throw on Shane Black's The Predator, which was just released on Blu-ray in time for the holidays. In time for the holidays, a animated Predator holiday short was recently released to celebrate the Blu-ray release of The Predator. Santa's elves and reindeer get systematically hunted by a Predator and things get pretty bloody before the tables turn. It's worth a watch and might even be better than the movie itself. If you're interested in getting your hands on some of the Predator whiskey, you can head over to Dutch Whiskey to reserve your bottle. While you wait, you can drink any other kind of whiskey while watching any movie from the Predator franchise, or perhaps even work up the courage to write your own screenplay for a future installment.